An Arizona State University fraternity's operations have been suspended following accusations that the local Tau Kappa Epsilon chapter hosted a distasteful party in commemoration of Martin Luther King Jr. Day, replete with racist stereotypes and offensive costumes. University officials planned to meet Tuesday with fraternity representatives regarding the off-campus party over the weekend. "The party TKE held last weekend was not held on campus and was not a sanctioned university event. 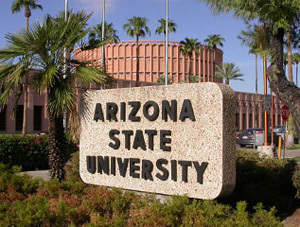 Because of the latest incident, ASU has suspended chapter operations (and) can and will take additional action against the individuals involved," Sharon Keeler, an ASU spokeswoman, said in a statement Tuesday. "It is unfortunate that a few misguided individuals held an offensive party at a time when ASU, the state and the nation are celebrating Dr. King's achievements and legacy." Alex Baker, a spokesman for the national fraternity organization, said representatives plan to meet with university officials on Tuesday to discuss the matter further. "Tau Kappa Epsilon does not condone or support any actions by its members that would be defined as racist, discriminatory, and/or offensive," Baker said in a statement. "It is with embarrassment and regret when a few individuals within our organization make decisions that do not align with the values and principles of Tau Kappa Epsilon." Pictures from the party made their way onto social media websites, depicting guests dressed in basketball jerseys, flashing gang signs and holding watermelon-shaped cups, among other things, KPHO-TV reported. "I think this represents the ignorance that still exists today. This is just one example of the kind of things that occur here," Kaajal Koranteng, an ASU senior, told the TV station. The Rev. Jarrett Maupin, an Arizona civil rights activist, said the party antics were outrageous and offensive. He is calling on the school to expel all students involved and permanently ban the fraternity from campus. "It was just a raucous, racist rally, and they used Dr. King's holiday as a mask for racial villainy and harassment," Maupin said Tuesday. He plans a news conference Tuesday afternoon with numerous community leaders. The Tau Kappa Epsilon fraternity was already on probation for previous offenses in 2012, according to ASU. The university did not provide additional details of the disciplinary action. Founded in 1899 at Illinois Wesleyan University in Bloomington, Ill., the fraternity has about 257,000 members at 291 chapters and colonies across the United States and Canada, according to its website. In 2012, the University of Arizona stripped its local chapter of Tau Kappa Epsilon of recognition after an investigation showed multiple instances of dangerous hazing. Martin Luther King day is a day to be celebrated but not the way the TKE fraternity did at Arizona State. It's sad to see that people are still disrespectful and discriminate the people that are different then them. I am not only talking about people with a different skin tone but also the people that are physically disabled, or have a learning and talking disablement. The United States is still full of all types discrimination and this party shows it very well. College students are always looking for a party, trust me I have been to a party school where the parties start on Thursday. College students love their parties, but what they don't know is when they throw these very disrespectful parties it reflects on the fraternity and the whole University! So they need to pay more attention to what they are trying to say through their parties. One question I do have is how does a party get planned and carried through without someone that is over the fraternity not knowing? How did this party go unseen to the head of the fraternity until the photos got on social media and it was already over?? Maybe these fraternity people need to watch their fraternities a little more carefully if they don't want parties like these to happen. Yea I agree with your statement about college students needing to think more about how you might offend people with these crazy party ideas. The whole situation could have been avoided if it was just a nice simple normal party because costumes don't make a difference to a party, its all about who your with. Also with the fraternities watching the activities of its members, I believe they need to set up a system in which they report all plans for activities to their head leaders to pick the best course of action. this way the situation won't happen again. I totally agree. How come no one was aware that kind of party was being planned? There is no way the fraternity can get away with that. Even the party being held outside the university, it automatically carries the name of the fraternity and the university on it, it doesn't matter. It is a shame for such a traditional institution. However, "the fraternity was already on probation for previous offenses in 2012, according to ASU" so that means it s not the first time that a smilar thing like that have happened to them. Maybe they should get punished enough this time. This fraternity shows it has historically been problematic with hazing and now this party. Fraternities are always looking for reasons to celebrate and to throw parties, and themes to attract people to the parties, but it just happens that this time it was planned poorly and without much thought. There could have been illegal activity, like drug use, at the party, but the news chose to cover the racial aspect of the party and I find that interesting. the media may have covered the racial aspect of the party because it was the main problem of that event, and they have pictures to back it up and prove their argument. Public harassment and disrespect is also considered an illegal activity and should be punished. The Actions taken by the students of the TKE fraternity were really disrespectful and really did bring down the expectations of the University as a whole. This kind of thinking is what is really bringing the nation down also as a whole. That day is a ceremonial day, of remembrance and those students really just showed what Dr. King was actually trying to prevent with the accomplishments that we celebrate him for. 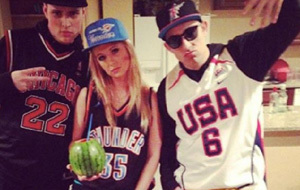 I understand that college students all want an excuse to dress up and be crazy for a night, but they could have done any type of party, but in someone's mind they decided to take the more extreme racist approach and make it more of a make fun of African American party, which is really offensive to me. In all my years I have never heard of a make fun of white people party, because bringing race into that environment just dampens the mood and makes situations awkward. Really I believe that there should be consequences for the students in the pictures and any other guilty party, because in making a mistake consequences can help. I think it is kind of shocking how MLK day was used to cover up for some college party including offensive and racial items and themes. This is not how it is supposed to be and it should result in consequences so that people involved learn how disrespectful they have acted. It would be interesting to know if people at this party do know about the historical significance of MLK day and furthermore, if they knew about the kind of party they were attending. In either way, discrimination should be one topic to be addressed in order to make them realize that such a party on a day like this is a "no go". But the scheduled conference will uncover more. It is true that people who were involved must be punished. MLK day is not a normal day. US celebrate one of the biggest events along its history and now some college guys dishonored this important day because they decided to party. It has to be a punishment to the upper charges of the fraternity as well because the allowed let them throw the party. Also i like that the picture is public now, because that way people can recognize them and they can feel ashame of themselves. I think this party was poorly put together and supervised by higher fraternity members. those who participated should be ashamed of themselves for disgracing a national holiday even if it was within the walls of just the frat house. These days people can see just about everything that's going on even if they arent apart of it due to facebook, instagram, twitter, etc. Just because they got caught doing it doesn't make it right. I believe they should be punished by the fraternity's upper management but the school should not be involved since it wasn't on school grounds. This is very raciest, only because this fraternity doesn't allow black people in, in the first place. They should be punished by the upper management from the fraternity. You don't honor someone by dressing up as slaves at a party that they were hosting. This is just disrespectful to a lot of American's. This is just evidence to me that people's brains don't fully develop until age 25. By no means am I suggesting that this is an excusable offense because they are young. I just don't think these college students realized the effect that this party would have on them and their fraternity's image. I doubt that the majority of those that attended the party are racist or even close to it; I think they heard there was a party, costumes and alcohol were involved, and it'd be a great way to socialize and have fun. I bet there were even a few black students that attended. I know people go to college to have a good time and most people there want to drink and be merry. But what these college students do really understand that what you do in college will affect you later in life. The pictures you post of that crazy night hanging out with friends and drinking can be found by your future employers. The DUI you got, also can be seen by future employers. We got to college to help us have a better future but how can you have a better future if all you do is party and drink. I really agree with you first because I bielieve that people does not think very maturely untill they are older than 25. However that is not an excuse because the are old enough the realize what is wrong or not. Also I agre when you say that probably the majority of those eho attended were not racist and that is why the punishment should be to the head of that fraternity, and for those who are involved with the pictures. The university must do an investigation about it. There is anything bad with parties. actually I agree that college is the time to do that and enjoy, but this kind of behaviors are which make adults doubt about young's criterion. It is unbelievable the level of stupidness that people can get. Taking into account the importance of Martin Luther King's day and how much it does mean to people from US. Fraternities need to realize the indicated day to throw a party, and then realize who is going to come (Guys from the picture for example). It is sad because of course this issue was from a specific number of people and not from everybody from that faternity. Now the punishment must goes to the leader of that association and to the entity ''fraternity''. Also do a research and punish those who are really involved. This party had such an extreme disrespectful tone towards other people. It actually just proves the point that, unfortunately, this country is still contaminated with discrimination. It is very sad to see this kind of facts happening, specially in the university world, which it was supposed to be more open-minded and have modern concepts. This generation was not born in segregation, so there is no point in keeping this roots of discrimination towards different people. Ok so I understand and completely agree that what the fraternity group did was horrendous and it was in fact a party thrown out of pure ignorance; however, it isn't illegal. Unless someone can show me something that says throwing a party like this is illegal, then I don't really see any "problem". The punishment should simply be getting kicked out of the fraternity and maybe getting some sort of punishment from the school, but is a press conference really necessary? The article states "I think this represents the ignorance that still exists today. This is just one example of the kind of things that occur here" and I completely agree with statement. But really these students, as ignorant as they may be, have every right (in my opinion) to throw whatever party they wish. Are we calling Miley Cyrus racist because she's wearing a jersey and acting like she's black in her music video? Are we kicking white students out of school because they decide to sag their pants and wear doo-rags? Not that I have heard of. I don't agree with what they did but I don't think it deserves as much attention as it is getting. "I think this represents the ignorance that still exists today. This is just one example of the kind of things that occur here," Kaajal Koranteng, an ASU senior, told the TV station. I think that quote sums it up. I always think it's funny to read about what kinds of things the fraternities do here because it seems like an outward representation of the fact that there is still a lot of races and being bred underground. These are young people in America so it seems that the value of racism and stereotyping is still being taught to children. I'm not sure the fraternity members or partygoers realized how racist they are costing and decorations were, I think they were just being insensitive and ridiculous. Arizona State University is known as a top party school across America. I am not surprised that the frats are once again in trouble. Fraternities like these, are the reason that greek life and huge schools like ASU have such a bad reputation.